← Be a SGWA Volunteer – Training May 19! Sign up now! 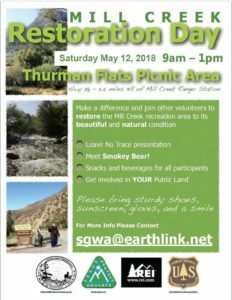 Join SGWA volunteers at the Thurman Flats Picnic Area on Saturday May 12, 2018, at 9:00 a.m. for the first clean-up day of the summer. Come and meet Smokey Bear! Everyone is welcome! Bring sturdy shoes, sunscreen, gloves and a smile – we’ll provide snacks and beverages. Learn about Leave No Trace and help restore Mill Creek to its natural beauty. See you there! This entry was posted in Event, News Items. Bookmark the permalink.